Legend has it that almost immediately after the crucifixion of Jesus, his followers began to retrace his steps to Calvary. 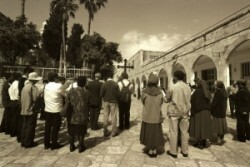 The term –Via Dolorosa- The Way of Sorrow was popularized in the 16th century and its fourteen stations were standardized by the Franciscans during the 19th century. 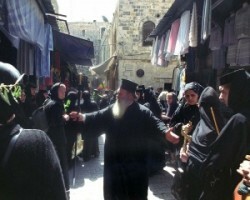 The Way of the Cross, Via Dolorosa or Via Crucis designates a stretch of road between the Antonia fortress and Golgotha, along which Jesus Christ walked bowed under the weight of the Cross. The name dates from the sixteenth century, although the custom of retracing Jesus' steps to Golgotha began in the early centuries of Christianity. Way of Sorrow- Fifth Station. – As the inscription above the door of this Franciscan chapel says, here Simon of Cyrene took the cross from Jesus and carried it on to Golgotha. This is mentioned in three Gospels, but not in that of John. Way of Sorrow- Fourth Station. The meeting between Jesus and his mother is commemored by a small oratory with an exquisite lunette over the antrance, adorned by a bas- relif carved by the Polish artist Zieliensky. The Way of Sorrow- Ninth Station –A column near the Ethiopian monastery shows the place where Jesus fell for the third time. The Way of Sorrow-Seventh Station. 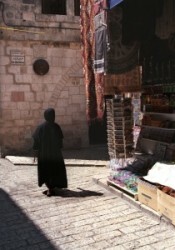 Here the Via Dolorosa intersects the noisy bazaar, and a column marked with the Roman numerals VII indicates where Jesus fell for the second time. 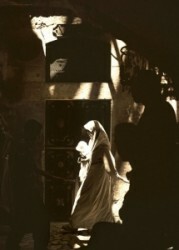 the Chapel of the Flagellation where tradition holds that Jesus was interrogated by Pilate. The Franciscans and Pilgrim's begin their weekly procession through the Stations of the Cross here, on Friday afternoons. 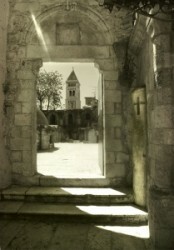 This modest chapel was built on the site of a Crusader oratory. Inside are glass panel representing the scourging of Jesus (center), Pilate cleansing his hands of the blood of the innocent (left), and the liberation of Barabas (right).